Nikki Albrecht had wanted a puppy for a long time, but she was hesitant. It would definitely be a big responsibility, particularly since she lived in a studio apartment in New York City. So while she hesitated, she nurtured her love of dogs by following sites like Petfinder and Social Tees Animal Rescue Foundation on social media. 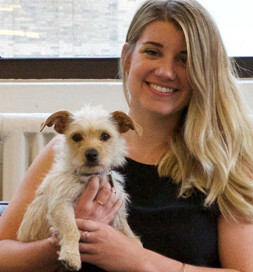 Lola, a terrier mix, is content living in a city apartment. One day Social Tees posted that it had taken in 15 puppies from an overcrowded shelter, and they needed foster homes for them. To Nikki, it seemed like a perfect opportunity to dip her toe into the water and see what it would be like to have a puppy. Thus, Nikki became a foster failure, and that is totally fine with her–and with Lola, too. The two of them became a family. “The more progress she makes and confidence she gets makes me feel as if I definitely made the right decision for her,” Nikki says. If she ever questions whether the decision was right for her, it only takes the enthusiastic and loving greeting at the door, to know it was right for Nikki as well.